So who was this Good King Wenceslas bloke whose name is so widely celebrated in song around this time of year? First up, he wasn’t even a king at all. At least he wasn’t while he was alive. What he was was a saint, which some might argue is a step up from mere regality. 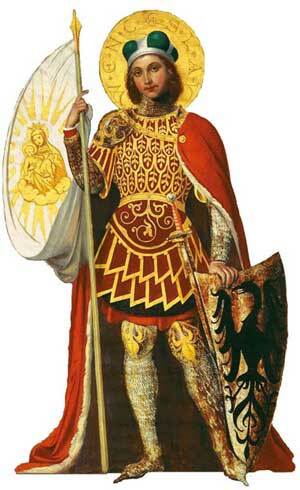 To be specific, he was Saint Wenceslaus I, Duke of Bohemia (Svatý Václav in Czech) who lived, unsurprisingly, in Bohemia from 907 to 935. Renowned as a leading provider of alms to widows and orphans and of succour to the downtrodden generally, Wenceslas is best remembered for the very probably apocryphal story of Boxing Day altruism recorded in the ever-popular carol. In a nutshell, the story is as follows. GKW is gazing out across a moonlit winter landscape when he spies some unfortunate peasant scouring the snowy ground for something he can burn back at his hovel. Enquiring of his faithful squire who this obvious alms-target is and where he makes his abode, Wenceslas learns that the man lives “a good league hence, underneath the mountain, right against the forest fence, by Saint Agnes’ fountain, which narrows it down fairly precisely. In a rather more bellicose vein, the Czechs continue to revere GKW as their patron saint and believe (as with the Arthurian legend here in Britain) that Wenceslas will one day rise again in his country’s hour of need and slay its oppressors (a duty he mysteriously neglected to perform back in 1938). The saintly monarch is said to sleep alongside a huge army of knights inside the Blaník mountain. A local variation in Prague holds that his equestrian statue in the eponymous Wenceslaus Square will come to life and ride across the Charles Bridge to raise his knightly underground army, pausing briefly en route to collect the legendary sword of Bruncvík (currently concealed beneath the capital’s cobbled streets). This entry was posted in Searchlight Insurance Training News. Bookmark the permalink. 1 Response to Good King Who?